Knowing how many miles you can drive on an empty gas tank prevents getting stranded. Nissan Altimas can go the farthest when the low fuel light is on. Every driver occasionally lets their gas tank get low enough to trigger the low fuel warning light. Even though we all know it's best to keep your gas tank ¼ full, we still let it run low from time to time. 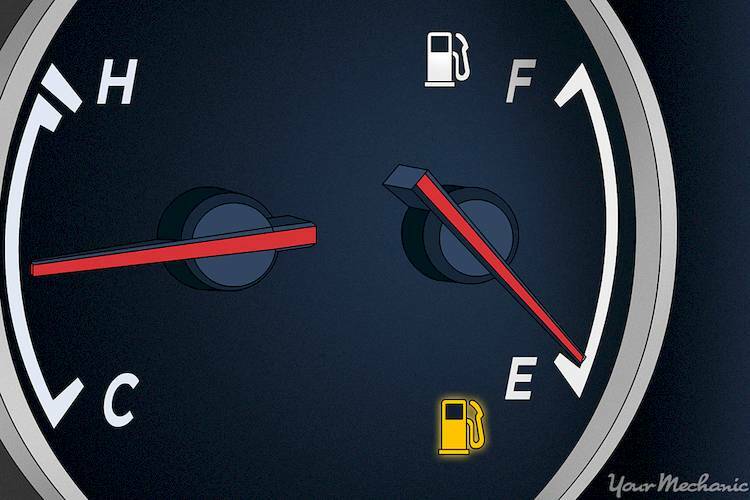 Knowing how far you can drive on an empty gas tank will help keep you from getting stuck on the side of the road. Before letting your car run on empty again, it’s worth knowing just how many – or how few – miles you can actually drive after the light comes on. It’s also smart to know what else is at stake when you let your gas tank run to near depletion. Part 1 of 3: Is it dangerous to drive with the low fuel warning light illuminated? The primary concern when driving on empty is the possibility of running out of gas and getting stuck on the road, which is not only a hassle, but also a potentially dangerous situation. You may break down on the freeway, where the surrounding cars are traveling upwards of 70 MPH, or you may break down on a blind turn on the highway, where a vehicle could rear end you. Or you could run out of fuel in the middle of a desert, like what surrounds Tucson, Arizona and Las Vegas, Nevada, or on a frigid snowy road outside Chicago, Illinois, or Cleveland, Ohio. That said, driving on empty can also do damage to your vehicle. If you do run out of gas, you can do damage to your catalytic converter, which may then need to be repaired or replaced as a result. Even the simple act of driving with a low amount of fuel in your tank can damage your fuel pump, as any debris or contamination in the gas (which naturally settles at the bottom of the tank), will be sent through your fuel pump when the tank is nearly empty. You’re not going to ruin your car the first time you drive it with the low fuel warning light on, but it’s a harmful practice to do regularly. Part 2 of 3: How trustworthy is the distance to empty gauge? Most modern vehicles have a distance to empty gauge on their instrument cluster, which provides an approximation of how many miles can be driven before the car runs out of gas. Many people prefer to use this feature in lieu of the low fuel warning light, figuring that if the gauge says there are 20 miles left, then they have 20 miles before they run out of gas. However, this is a dangerous practice, as the distance to empty gauge only offers a rough approximation. This approximation is based on the average mileage that you have attained while driving your vehicle, which means that it may not be very accurate relative to your current driving conditions. For instance, if most of your driving is done on the highway, then your distance to empty meter is probably not very accurate when you’re stuck in traffic. So while the gauge provides a fairly accurate approximation when your tank is relatively full, it shouldn’t be used to figure out your exact number of miles remaining in the tank when you’re running on empty. Part 3 of 3: How far can you drive on empty? Exactly how far you can drive on empty depends on your vehicle, your driving habits, and road conditions. However, you may be surprised to see how few miles you actually can drive once the low fuel warning light comes on. Here is the range for how many miles you can drive – as well as the point at which the warning light illuminates – for the top 50 best-selling vehicles in the United States in 2015. Driving on empty is sometimes a necessity, and when you find yourself in that situation, it is important for you to know exactly how many miles of range you have left. Figuring this out beforehand is a good way to be prepared when the tank gets really low, and to avoid a breakdown. If you notice that you are reaching empty unusually quickly or have leaking fuel, be sure to have an inspection performed as soon as possible. Q: Getting error code P0463. Q: How do I view the average fuel economy?